1. As I was in the shower (because that's where a lot of my good thinking is done), I thought about a picture I saw on my parish's facebook page. In it was a mom with her daughter, who appears to be around 2-3, getting her ashes on Ash Wednesday. My first thought was, "Are you kidding me?" This was the grand-daughter of the woman who walked into Church before Mass and spoke out loud to the little girl to try to quiet her down. They sat 3 pews up from me; mom was chewing gum and grandmother (she's not that old, BTW) kept trying to quiet down the girl by speaking in a normal voice (not a whisper). Then, mom gave the girl a sucker to quiet her down. Oh, it worked, alright! As I watched this, I had to chastise myself for judging and not focusing on the real reason I was sitting in that pew. 2. Then, I got out of the shower, got dressed, and heard a "ping" on my phone. It was a notification from my 365 Days of Mercy App (which is free), so I sat down on the side of the bed to read it. And I read: "Here the 'judge not' of the Gospels applies with full force. We can render judgment concerning ideas, truths, or errors; good or bad actions; character, temperament, and what appears to us of a person's interior disposition, but we are utterly forbidden to judge the innermost heart, that inaccessible center where the person day after day weaves his or er own fate and ties the bonds bringing him or her to God. When it comes to that, there is only one thing to do, and that is to trust in God. And that is precisely what lover for our neighbor prompts us to do." (Jacques Maritain). UGH. I really need to work on not judging people. 3. I remembered a dream I had overnight. A former coworker was in it, and we were getting along. When she first starting working for our school system, I'm afraid I wasn't very nice to her, and it wasn't her fault she was put in the position she was in. Okay, Lord...I get it. I'm going to write an apology letter to her and mail it to her house. 4. I was so disappointed with the light turn-out to Stations of the Cross last Friday evening. My parish does the version called Praying the Stations with Mary the Mother of Jesus. It is absolutely beautiful and so very meaningful to apply the Stations to your everyday life. 5. My prayer list is growing. In the past, I would tell people I would pray for them, do it then, and not follow through with it. 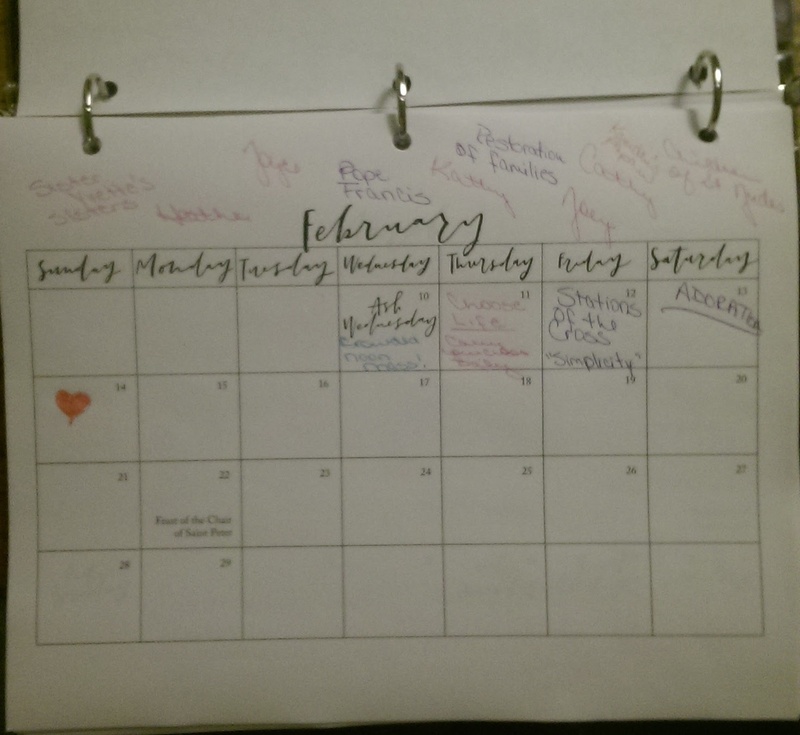 Enter the Blessed is She On the Way Journal for Lent. 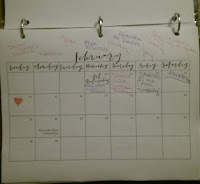 It includes a monthly calendar, so I'm writing down the names of people to pray for around it as a daily reminder. 6. I think I have Prayer-Life Bipolarism. I can be so up one day, and then the next day seem to hit rock bottom with my prayer life. Quick prayer to St. Michael & a Hail Mary to put the devil back in his place! 7. I pulled out my old Steven Curtis Chapman cd the other day and listened to it in the car. I thought this song went perfectly with the purpose of Lent. 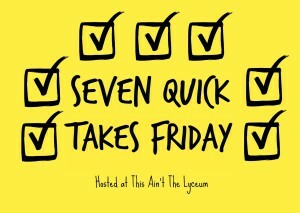 For more Quick Takes, visit This Ain't the Lyceum. "we are utterly forbidden to judge the innermost heart" Wow...that's pretty heavy stuff. It struck me big time! A thoughtful post, and I also enjoyed your choice of songs for us! That's a great idea to write down the names of people you need to pray for. I could use a little notebook like that! Mary, I love the heart you wear on your sleeve! Great post!